Bowling Green's Chris Nell makes a save earlier this season. 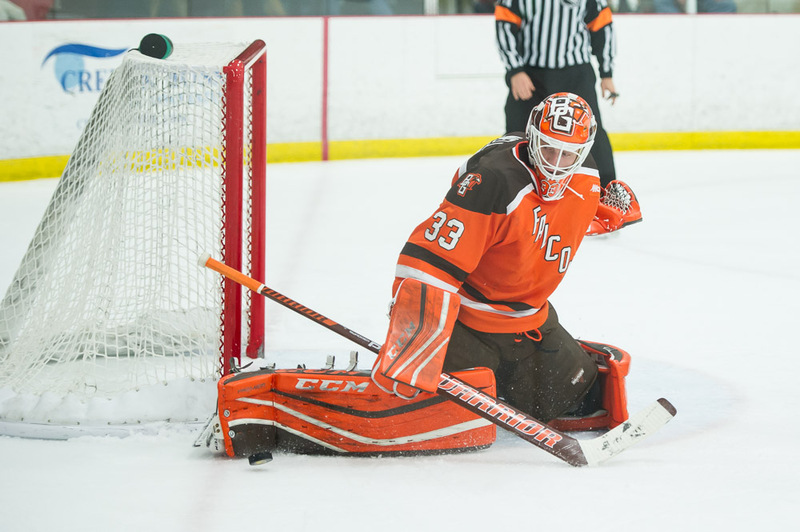 The junior made 20 saves in Friday's 3-0 loss to Northern Michigan (Photo by Todd Pavlack/BGSUHockey.com). Bowling Green failed to score Friday night. Thirty-five shots on goal and 57 total attempted shots weren’t even close to enough for the Falcons, who played most of the game on the perimeter. 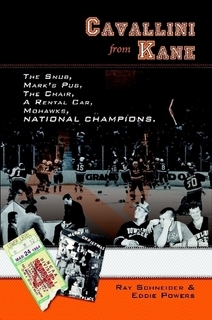 The result was a 3-0 loss to Northern Michigan at the Slater Family Ice Arena. Atte Tolvanen recorded 27 of his 35 saves during the first two periods, and Robbie Payne had a goal and two assists for NMU. Payne assisted on both NMU goals in the first period, and scored an empty-net goal with 52 seconds left in the game. The Falcons totaled a 35-23 edge in shots on goal, but were shut out for the second straight game following last Saturday’s 5-0 loss at Ferris State. Although Tolvanen played well, BG had few rebound shots as NMU cleared the puck after the first save. The Falcons also put little traffic in front of the net to make life difficult for Tolvanen. BG is third-highest scoring team in the Western Collegiate Hockey Association with an average of 2.78 goals per game, But the Falcons have scored two or fewer goals in four of their last five games, totaling only seven goals in that span. “We didn’t get enough second or third chances around their net,” said BG forward Stephen Baylis, who had five shots on goal. Forward Matt Pohlkamp led BG with seven shots, while defenseman Sean Walker also had five. POWER PLAY: The Falcon power play was 0 of 3, totaling only four shots in 5:21 with the man advantage. WCHA: The Falcons remained one point behind third-place Minnesota State in the WCHA. MSU was a 4-2 loser at Alaska-Anchorage Friday. But the Falcons are just eight points ahead of fifth-place Alaska (Fairbanks) and nine points ahead of sixth-place Ferris State and Lake Superior. Alaska was a 3-0 winner Friday at home against Alabama-Huntsville. The Falcons are 14-16-2 overall and 12-12-1-1 in the WCHA. “It’s getting to be that time of year where if you start losing some games, you’re going to start losing some spots in the standings,” Baylis said. BG has just three league games remaining, Game 2 of the NMU series and Feb. 24-25 at home against Alabama-Huntsville. After this weekend’s series conclude, MSU will have four league games left, and Alaska, Ferris and Lake Superior all will have six league games to play. The top four teams host first-round playoff series. NMU continued its late-season push for a playoff spot. The Wildcats and UAA both moved within two points of eighth-place UAH for the final playoff spot. NMU and UAA both have two games in hand on UAH. NMU is 8-17-4 overall and 6-12-3-1 in the league, including a 4-0-2 record in its last six games overall. RECAP: Shane Sooth’s power-play goal opened the scoring, six minutes into the first period. The senior forward scored during a 5 on 3 after an interference penalty to Chris Pohlkamp at 5:07 and a tripping penalty to Alec Rauhauser 31 seconds later. The second penalty came after BG failed to clear the puck from its defensive zone. Although NMU made a nice play to score the goal, Bergeron said BG made a mistake on its penalty-kill. The Falcons have taken too many unnecessary penalties of late, but they’ve survived because of their quality penalty-killing. BG entered the game 20 of 20 in its last four games and had killed off 22 straight chances overall. NMU’s power play was 1 of 3. After Sooth’s goal, the Wildcats carried the play throughout the rest of the period. NMU increased its lead to 2-0 on Zach Diamantoni’s goal at 11:18. Diamantoni also assisted on Payne’s goal. BG had started the game with a number of good shifts prior to the 5-on-3 goal. HOT AGAIN: Tolvanen played well for the fifth straight game. He’s stopped 137 of 140 shots (.979 save percentage) in those five games, including back-to-back shutouts of the Falcons and UAA. Tolvanen was the goalie on the All-WCHA rookie team last season, but struggled during the first half this season. The sophomore stopped just 34 of 40 shots in BG’s 5-1, 5-3 sweep of NMU Nov. 11 in Marquette. Tolvanen hasn’t allowed a goal in his last 155:49, improving his goals-against average to 2.69 and save percentage to .910. RARE: The Falcons were shut out in back-to-back games for the first time since Nov. 25-26, 2011 when they blanked twice at home by Alaska.